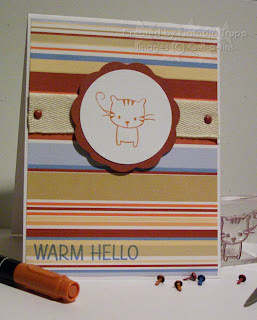 When I started this card, I intended to try using a ribbon tab as an embellishment. That didn't end up happening, but the Seaside ribbon did provide the inspiration for my colour combination (and I ended up using it too, but in the normal ribbon sense). The white circle has the present stamped, as well as the greeting multiple times. Then I coloured and glittered up another present and popped it over top, to create a subtle shadowed image effect. The background paper is one the presents in the gel-a-tins Happy Birthday set, stamped repeatedly. 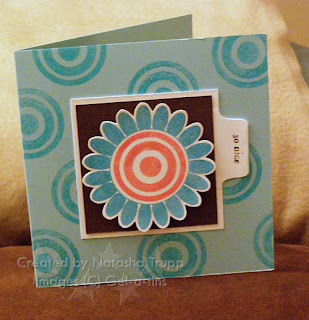 My scalloped circle was made using the corner rounder (tutorial from October to your right). I wanted to make a clear card, it's been while, so I brought the acetate back out. 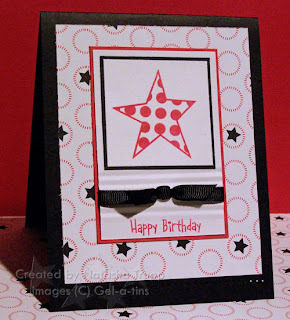 I stamped the small and medium stars from gelatins with white stazon for the background. The patterned paper is from Cherry Arte again. The main image with the sentiment is one of THE reasons I have become so obsessed with the clear stamps. No pulling out the stamp-a-ma-jig, just ink, and stamp. It's so nice to not have to use that extra tool and step. I also did the same layout as the other star card from last week. It's a layout that works so well for many different types of images. 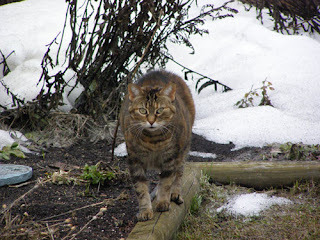 Also, here's a picture of my cute Sammi-cat. She was thrilled to finally be able to reach the corner gardens today. She looks really chubby here, but honestly she's not! She's also slightly chilled so her fur is sticking up and out. It was decent out, but still quite windy. I cannot believe how fast this snow has melted! Seriously, 2 weeks ago, I was "wading" through at least 3 feet of snow in the backyard like it was quicksand. This is a card idea that I've had in my head since I first saw Crab & Company way back in January. 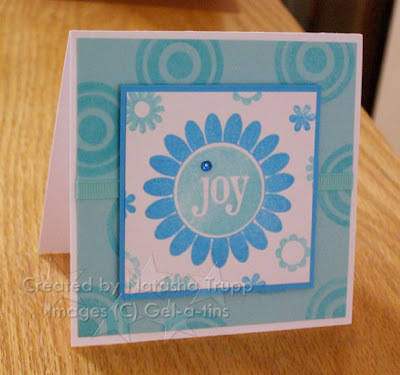 I decided that to get back into the stamping groove I needed to do something fun and vibrant. There's something about these 2 sets that makes me want to use Real Red, Green Galore, and Summer Sun as a colour combo! It's funny, since it was a rainy day. Everyone was so glum about the rain. It's above zero, the rain makes the snow melt faster, and so far, there haven't been any floodwatches for the city, what's there to complain about!! Spring is here! Be happy! Anyway, here's the card, I hope it makes you as happy as it makes me :D The greeting is from a Hero Arts clear set. The ribbon was some patterned grosgrain. I flipped it over, and dotted the matching colours on the white side with markers. Not perfect polka dots, but still fun! I decided to do the Featured Stamper challenge this week. The artist in the spotlight? 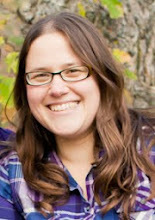 Kendra Giles (go to her blog, it's awesome: Inkin' it Up!). Anyway, here is my card, used both gelatins and green grass stamps on here. I kept the colours the same as the original piece (see that here: Inspiration Piece). 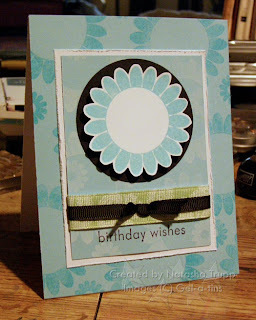 I changed the stamps, added a little layer, used the flower as the scalloped circle, and changed the ribbon. 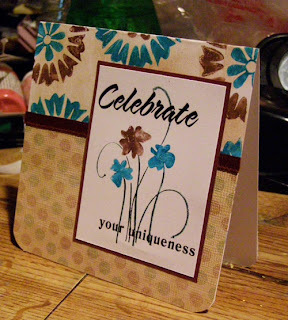 There's that dreaded trio of words for me as a cardmaker... It was my cousin's birthday this past Wednesday, he just turned twelve. He's got a rather dark, sarcastic sense of humour, like the rest of us, so what do I do?? Balloons seem to childish, as to fun animals, obviously flowers are out (although he might've found that funny...). So I first found a layout I wanted to do (this one should look familiar (see this post from December 31, 2006 ). Then I found some inspiring background paper (these stars are by Cherry Arte). The star from gel-a-tins Superstar, just seemed to be the obvious match. So here it is. There is some piercing along the bottom, but as I have discovered, that's kind of ineffective. I will likely still add an inside white piece of paper for signing and whatnot, then the piercing may show a bit more. Seriously, this was not a fun week at work. Everyone who came in just had problems with something, everyday. However, today was a fabulous ending to the week. All my favorite people came in, and everyone was just so darn happy and nice. If it hadn't been for the dratted, deafening, duct-drilling next door (say THAT 5 times fast! ), the day would've been perfect. 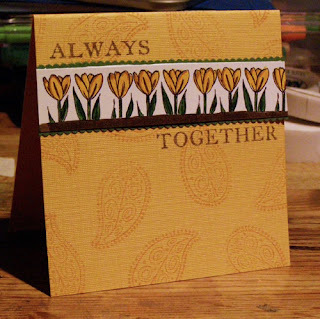 Here's a card I did yesterday, I decided to try the frayed technique finally. I was one of those afraid of ruining my beloved ribbon, but you know what, it was a lot of fun! I'm not totally happy with the card. A few water splatters some how appeared on it, as did an inky finger print, but hey, it's cheerful, and it seems to represent the week I had: a few mess-ups along the way, but a bright and cheerful ending. These past few days have been busy and exhausting, so unfortunately blogging had to be placed on the back burner. Last night we went to the play, The Constance Wife. We were all feeling quite apathetic and not wanting to go, especially since it had 2 intermissions. I had heard it was a comedy, but my parents thought it was more a dramedy. Turns out, it was pretty funny. Still liked the line from the mother "Are you in love with him? Well there's only one way to tell... (dramatic pause), would you use his toothbrush?". That was pretty funny! But now I have returned, and I am on a post-apple crisp sugar- and black tea- caffeine buzz. (I'm not a regular caffeine drinker of any sort). Anyway, on the 19th.. I received my Green Grass Stamps. They are beautiful. 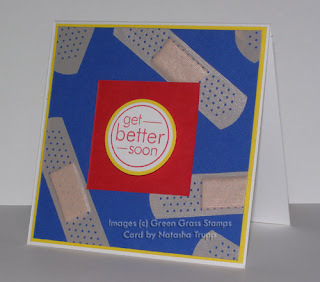 I really wanted to make something fun with the get better soon stamp. I found some of my el cheapo bandaids and stuck them all over the blue cardstock. I thought this made an adorable background. I was also really feeling these colours (brilliant blue, real red, and yoyo yellow). I find I tend to neglect these, well the blue and yellow anyway (wouldn't want to channel the Blue Bombers...), but with the tan of the bandaid, it all seemed to flow. The greeting is popped up on a dimensional for added fun! And for any SU! 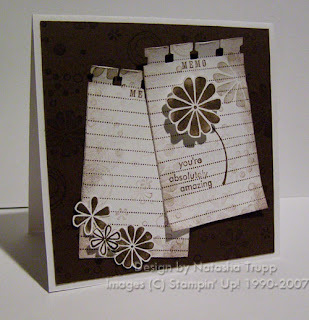 demos, I have a card on Stampers' Showcase today. It was actually already featured on my blog, here: http://palmtreesandpogosticks.blogspot.com/2007/01/showers-and-umbrellas.html if you care to see it again. Their scanned version is a tad washed out. Here's a card I made last week. My sister requested what she called a not-so-RAK. You can hardly call something that is requested, random right? So since she is hard at work, plugging away at the thesis, I decided to remind her that she is absolutely amazing. To make the striped notepad paper, I stamped the Office Accoutrement Memo stamp once, then flipped it upside and lined it up with the already stamped lines. This way I got my lined paper at the length I wanted without having to mask out the "memo". I also made my paper thin enough to avoid the large parentheses from that stamp. 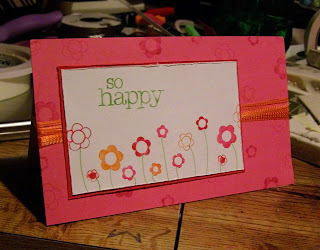 Then I used the spiral punch and bent, distressed, and sponged the heck out of those little pieces of papers. The chocolate background is actually wheeled. The flower clusters and the one flower on the stem are all from that Petals wheel as well. When I first got that wheel, I half-considered tearing it about. I didn't, but I considered it. 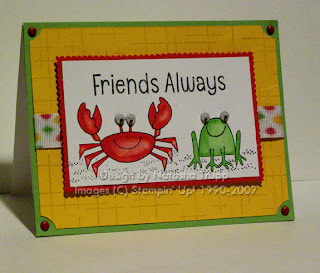 I was still in the creating mood this evening, so I put together this cute little card. I found some Chatterbox paper from that I had bought back when I first discovered the stuff. I also had bought Making Memories variety pack of mini brads in the Harvest colours. Those brads happened to match almost all the colours in this paper. Although if anyone cares, the colours in the pack closely match SU! 's cranberry crisp,really rust, perfect plum, old olive, more mustard, and brocade or buckaroo blue. It's always a nice bonus to find embellishments from different brands that coordinate with the SU colour palette. 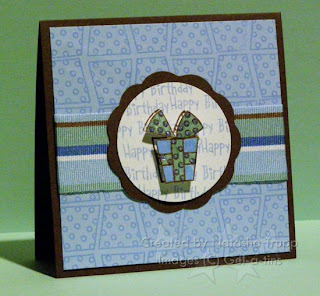 Even though the card is not at all nautical, the stripes reminded me of a seaside theme. So the scalloped circle and the twill tape just seemed to go. The main image is popped up on dimensionals since I have had little success in the past making small images stick over twill tape. Seriously, nothing seems to make the stuff stick, or stick to it! Anyway, if you haven't checked out the giveaway just yet, be sure to, it's the post right before this one. Here's a card I made today. I didn't really know what I wanted to do, but I thought I'd give you at least one day rest from the gellies. The flowers in Still-Life Stems are so large that you don't really want to add much to the card. I wanted to keep the flower the main feature. I find though that the hodgepodge hardware kits really lend themselves well to this type of card. 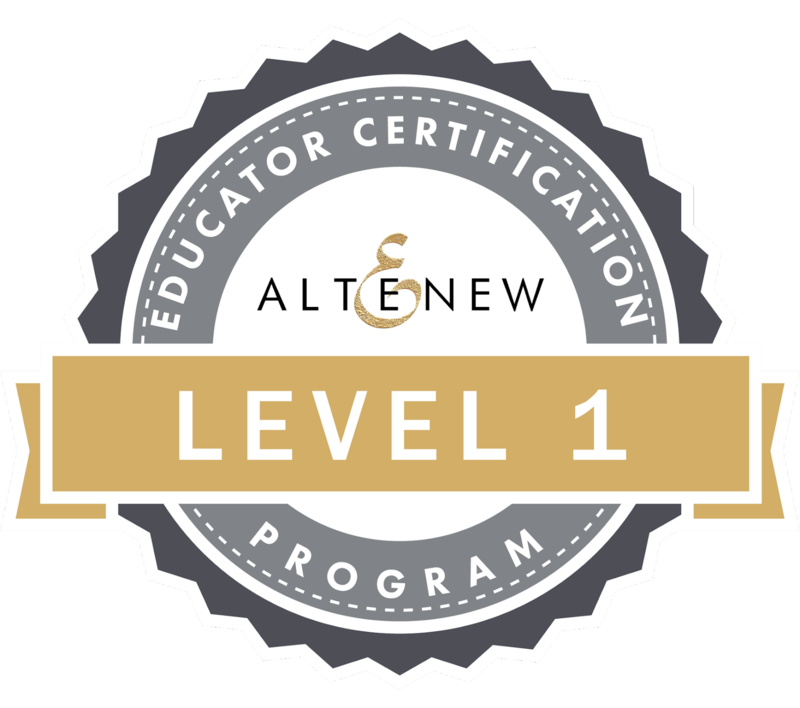 When you don't know what to do with all that empty space, throw on some strategically placed ribbon and hardware and then your card has a little something more. I also sponged the background piece to give it a little more dimension since I didn't feel like layering it again. Oh, the thanks is from the Hero Arts T set. But first, my card! I love this Superstar set, as soon as I saw it at Scraptivity, I knew I had to have it, there's just somethng about stars, I am obsessed with them! Also, I was really liking this week's colour challenge, so I used those 5 colours (rust, saffron, olive, chocolate, and caribbean). They are very fun, earthy, yet fresh colours. The card has a bit of a twist. I wanted a rounded card front with some of the inside stamping peeking out. I traced a large round object I found in my craft space (a lid of a hat box, if you must know!) I love making backgrounds with the clear stamps words. Even with my stamp-a-ma-jig, I would NEVER attempt this with wood mounted rubber stamps, talk about a way to drive yourself insane. 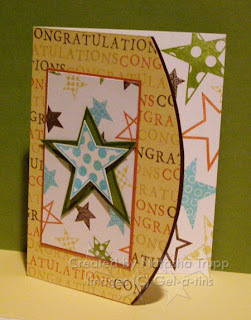 The congratulations is one of the sentiments from the Hero Arts messages set. Now onto the giveaway, right!! Alright, I've got a "naked", ready to be covered in whatever way you deem fit, DVD tin. Inside the tin will be all sorts of goodies, including some MM page pebbles, some American Crafts ribbon, and assorted papers from DCWV Far East and Once Upon a Time mat stacks, and maybe some other items that I find between Monday and now. To be eligible for the giveaway, please post your comment on this post. 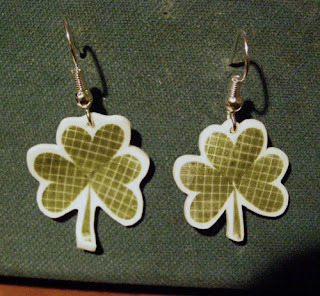 Sometime Monday night, let's say 9PM CT, I will randomly choose one lucky winner and post the name shortly thereafter. Sounds good? I look forward to hearing from you all! Here's a glimpse of the items up for grabs. 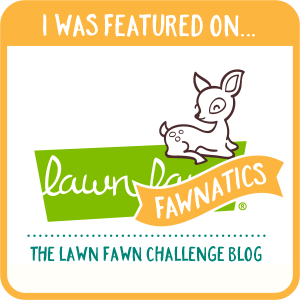 Well first off, whoa, I was blown away when I came to the blog today. 9 comments, you sure know how to make a girl feel appreciated! About the watercolouring, I generally stay away from the reinkers. I find that they are too vibrant for this type of subtle colouring. I've also found in the past that if you apply it a bit too dark, there is no going back (unlike real watercolours where you can usually smear the colour around quite a bit). Usually, I do the lid squish down thing, or I find a piece of plastic and scribble the markers on it. I find that the markers with my just barely wet aquapainter give me the colour I am seeking. Of course, I scribble around on scrap paper before going to my project. On this card, since the main image was stamped, and not painted, I gently nudged the colour off of the images as best I could, without adding much water. So, the only actual watercolouring was the sahara sand shadowing I added. Here's a card I made a while back. I was going with the watercolour painting hanging in a gallery wall look. I used the colours from the Seaside Ribbon Originals as my inspiration. When watercolouring with the water-based inks, you need to be extra careful. I used an aquapainter, but kept it very dry. That's the most important tip I've got. Sorry, no blog candy just yet... I hope to put something together in time for Friday, so stay on tuned! For now, here's a tag card I made. 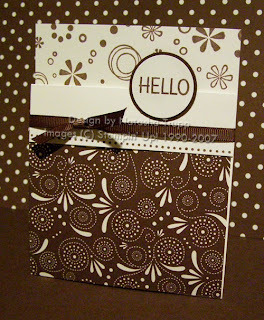 I thought the round tab punch would make a neat tag topper for each panel. 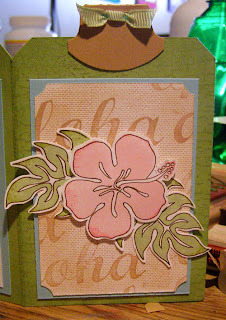 I think I used only Do the Hula, Stamp of Authenticity, Circle of Friendship,some other sentiment sets, and some backgrounds... I went with one of my other favorite combos- celery, rose/pink, and caribbean. I also threw in some caramel, chocolate, and cocoa, since I needed a few earthy tones. I really like how the outlined flower turned out. I had tried this once before while just doodling on a scrap piece of paper. With all the other brown outlined images, I needed to do something to make it pop. Here's a close up of that panel. I just love how it gives this set one more look. I made this card yesterday (sorry if you've seen it already). I love it when a card comes together so quickly and turns out exactly as imagined! I used the Petals wheel. To get the 3 colours in a fairly quick way, I rolled the wheel through the lightest colour (caribbean), then I simply coloured over specific images on the wheel with turquoise and teal markers. Easy! 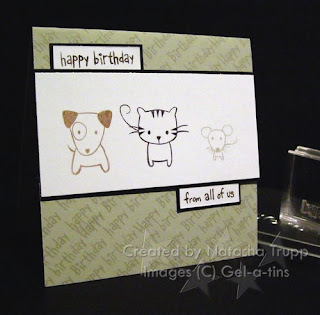 This method works well if you intend to only use your wheeled image for a card front (and not a background) and have a monochromatic colour scheme in mind. 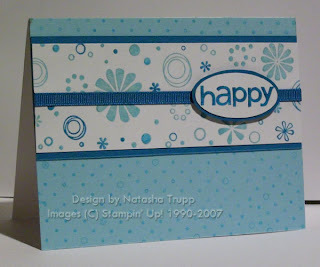 While making this card, I was disappointed to learn that the "happy" doesn't fit in the smaller oval punch. I used the large oval punch, and then carefully cut a mat around it. Sigh, there can never be enough sized punches. I was cleaning up my stamping area yesterday, and I found the Party Pieces wish card that was one of the make'n'takes at Convention. I set it aside thinking, I've got to use this as an inspiration later. I had bought the Petals jumbo wheel, but had yet to use it (probably a record time of 9 days of not using new stuff!). I wasn't in the mood for spring colours, so I went with chocolate inside. I cut a little bit more of my Au Chocolat paper for the base, then set out to recreate the wish card that so many demonstrators have made. For those interested in doing this closure, I'm sure there are a gazillion samples and instructions at SCS, but for your convenience I'll put them here. The card starts out as a 4-1/4x11 strip. Score it at 1-1/4 from on of the short sides. You'll fold that over, then punch out a half circle with your 1-3/8 circle punch on either side. For the designer paper, I cut it a bit long to give myself some "oops" room. The convention one was 3x4-1/4. I cut mine 3-1/4x4-1/4. The ribbon gets tied on after you've adhered the flap-fold together. (Do NOT attach the front fold to the back, only the flap together) You may notice that the card doesn't stay closed very well, that's where the cute little greeting tab comes into play. Get a pop dot, dimensional, or some foam tape. Place it where the middle of the circle would be. Then attach your circle tag onto that. Make sure that the circle slightly overlaps where you've punched out the half circle on the flap, this is what keeps it shut. Now it probably took me longer to type up these instructions than it did to actually make the card...to give you an idea of its simplicity (and no, I'm not a slow typer). So let's bring this fun layout back for a bit, I think it would lend itself well to all sorts of the fabulous spring mini sets and the patterend papers. In other news, I finally found the html code for posting my email address. So now, if you have any questions you can directly email if you like! Despite my hopes, this night was not as creatively successful as I had thought it was going to be. I went to a friend's house to help out with a Philisophy of Nursing art project, it's not done, there were a few bumps along the way. We needed to take a break from that, andI had brought along a small tupperware container of stamping stuff. It's really hard to narrow down what you think you'll want. I brought along my markers, 12 full-size inkpads, one sheet of cardstock coordinating with each of the 12 colours I brought, a stack of white cardstock, a paper cutter, some punches, some ribbon, various types of tape and scissors, and of course, several stamp sets (for sake of space available I only brought clear stamps). I only ended up making one card, but I really like it and its simple design. I liked what Sarah had done with the round tab punch (she de-rounded it, I guess you could say). And although you can't even tell that I snipped off the end of the punch, that was my inspiration point. Honestly, that's what I started with, that little tab with "so nice" on it. The rest of the card followed. These images are from the set Hugs & Kisses. With my order, I got a surprise gift, a little key chain tin with 4 images from that set. I decided to do some poppin' pearls, since I got a giant lifetime supply of the white pearl ex powder. I stamped the hearts in versamark, applied pearlex, then used those decorate scissors again to cut out the hearts to give them that lacy feel. The background was stamped in two tones, then covered with vellum to mute it a bit. I didn't want to add much more to the card base, but just white was too blank, so I used the scoring blade on my paper cutter and added an embossed line at the 1/2 inch point all around the card front. Now, keep in mind, this time actually includes coming up with the design, colour scheme, and all that good stuff. I had a few minutes to spare this morning before going to work, so I figured, why not do a card. I wanted to see if I could finish one before I had to leave. So here it is, I used stamps from both the A and T from Hero Arts Clear Design. I also used some decorative scissors. 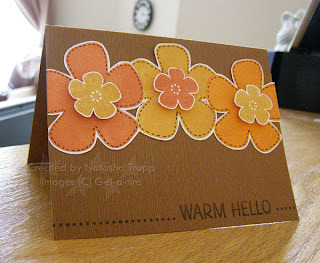 Since scalloped edges are back in, I figure, why not use mini-scalloped edges too? So the decorative scissors have found a spot on my craft table once again. If anyone is curious about getting their own gel-a-tins, I ordered mine through them here: http://www.gelatinstamps.com/shop/index.php. My LSS was willing to order them in for me, but their pricing system was actually higher than what the website had listed. The shipping was quite reasonable: $5.00 for expedited (got to me in 4 days from send date). I figured that what I paid for shipping, I saved on PST (they're in Ontario, and I, being in Manitoba, didn't have to pay their PST or ours!). As far as quality, they are definitely one of the nicest clear stamps I have used. They are extremely sticky, they stay on the block when using the stampin' scrub to clean (I've many a clear stamps NOT stay on during clean-up). The images stamp fabulously. I had a few bead a bit, but a little scrubbing on the dry side of the scrubber fixed that (that's how I also solve that problem with new rubber stamps). The packaging is also super cute, there's something extremely fun about the tins. I've also learned that I am quite fond of this over the CD case storage method. I'm probably going to pick up a few empty case from here: http://www.effectuality.com/store/product.php?store=cdn&lng=en for my other clear stamps. Here are my ATCs for an upcoming swap. I didn't know how much time I would have, so I only signed up for one spot. I used more of my new stuff. The little chocolates (and the words on the cranberry behind the chocolates) are from gel-a-tins' Chocolate Bliss set. 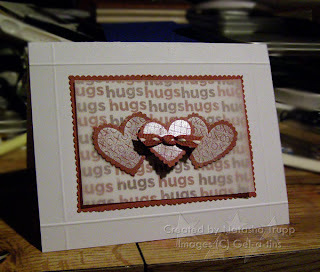 I embossed those using the chocolate bliss gelly powder. This stuff smells AMAZING!! I was getting a little hungry working with it. Hopefully there's still some smelly goodness left by the time the other swappers receive them, it's got a "smell date" of 3 weeks, but if they are sealed up, I imagine they will retain the smell longer. 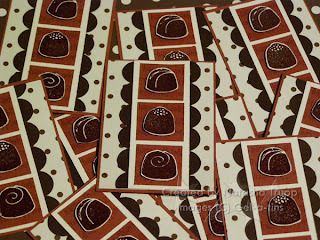 I also finally cut up some of my Au Chocolat papers, it seemed appropriate. The scalloping was done using the slit punch. I'm super excited to see what I get back. I love flipping through my samples from the last round. 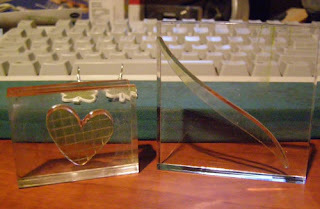 Here are a few items I made this afternoon. For the first one, I wanted to match the Bright Lights gelly gems (blue rhinestones), so I designed my card all around that little embellishment. It sounds silly, but it gave me a starting place. I knew what colours I needed to use to match, and I knew I needed an image that I could put the little gem with. 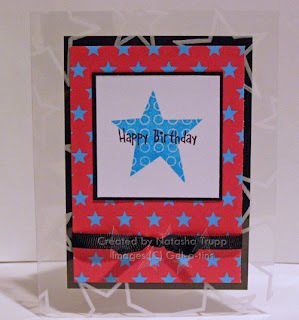 This little card is 4.25x4.25 and uses only the gel-a-tins Sparkle & Shine set, plus their gelly gems. The second item also started out with wanting to use a specific item. I picked up the Hero Arts ClearDesign Messages set today, and it has this dot stamp and this warm hello stamp. I really like the look of the dotted line, followed by a greeting, then more dotted line. So that was my starting point this time. I finally used some more of my special Christmas present papers. The card base is this nice brown textured paper. The flowers are from the gel-a-tins set Bloom. I masked the middle flower, then added some faux stitching with the chocolate chip marker. 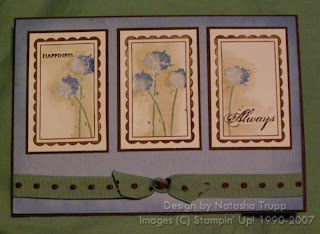 To finish of the flowers, I stamped 3 more little flowers from the Bloom set and attached those with pop dots. I was going to leave it on a straight panel, but I wanted to do something different, so I cut out around all the flowers and a few spots between them too. Happy Birthday, from all of us! Here's some more of my new gelatins. These adorable little critters are from the set Pet Shop . They are just cute. I am planning on making some cool stationary sets with them later, but for now, here's a card. I know the colours are somewhat...dull, but I was going with realistic animal colours. This was an idea I had once I had seen the stamps. I thought a line up of the animals would make a cute "from group" card. The happy birthday is a stamp, I hand wrote the "from all of us" to match the font as best I could. Sparkle and Shine with Joy! My order of gel-a-tins came today! Here's my first card, a quick, dependable layout. I love the versatility of this set (sparkle & shine) It's got flowers, stars, and these 3 sentiment circles, so it's really great for any occasion. I had Christmas in mind for this one, but it could be used for anything really. Change the colours and you've got a congratulations card, you know? If you're interested in these stamps, it's a Canadian company (yay! ), they are clear stamps, and they come in groovy packaging (tins). They are also one of the Scrap-a-Faire booth holders, if you want to check them out there or through the Scraptivity link to the right. Sorry folks, I've got to take the picture down, this creation has been accepted for publication! I recently obtained the Botanicals clear stamp set by Autumn Leaves. There are some beautiful designs inside this set. This colour combination was inspired by my box of ribbon from Jody. The teal and burgundy ribbons were both trying to escape the box next to each other. I would walk by them every day and think, "gee, those 2 colours look nice together". Finally I decided to do something about that. 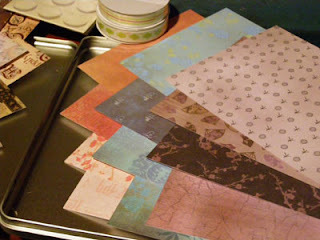 I used some textured cardstock from DCWV Far East stack, which conveniently also had these colours. The sentiment is from a Bo Bunny's rub-on. Also, I updated my profile picture with a nicer photograph. It's hard finding a picture of yourself that you can actually like. 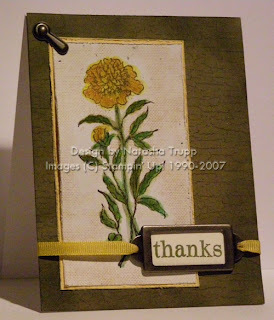 This is the photo I am sending to put in the May Stampin' Success for my November "Art Wow!" win.